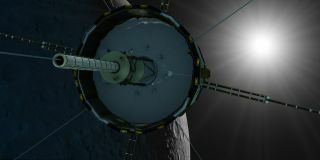 Artist's concept of the ISEE-3 probe's anticipated lunar flyby on Aug. 10, 2014. The golden years may be about to end for a 1970s-era NASA spacecraft. A crowdfunded team of engineers, programmers and citizen scientists aims to bring out of retirement the International Sun-Earth Explorer 3 probe (ISEE-3), which launched in 1978 and ceased science operations in 1997. The ISEE-3 Reboot Project could return useful data and help get the public excited about space science, organizers say. They also hope it inspires similar spacecraft-salvaging efforts down the road. "There's so much stuff up there. It's inevitable that somebody's going to say, 'OK, you're done with it; can I use it?" said ISEE-3 Reboot Project co-lead Keith Cowing. "I'm hoping that this will have a prompting effect in that regard, to get people to think differently." ISEE-3, a joint effort involving NASA and the European Space Agency (as well as its predecessor, the European Space Research Organisation), blasted off in 1978. It used 13 different science instruments to study cosmic rays and the solar wind, the stream of charged particles flowing from the sun. ISEE-3 initially operated from the Earth-sun Lagrange Point 1 (ES-1), a gravitationally stable spot about 930,000 miles (1.5 million kilometers) from our planet's surface. In the early 1980s, the probe was given a new mission, a new orbit (around the sun) and a new name — the International Cometary Explorer, or ICE. In 1985, ICE chased down Comet Giacobini-Zinner, becoming the first spacecraft ever to fly through the tail of one of these icy objects. The spacecraft then flew by the famous Comet Halley in March 1986. But the space agency didn't turn ISEE-3 off. The probe still has a fair amount of fuel left, and at least some parts of it still function, Cowing said. "The instruments may or may not work; we're not sure," he told Space.com. "But both transmitters work exactly as they should, which is a good indication that a lot of it works. You just wouldn't get the signals unless a lot of the spacecraft still worked." Cowing, fellow project co-leader Dennis Wingo and their colleagues are optimistic that they can contact the ISEE-3 spacecraft, order it to fire its engines and bring it close to Earth. But they know it won't be easy. For starters, the equipment that NASA used to command the probe no longer exists. So the reboot team has been combing through the ISEE-3 mission files, gathering information needed to create a virtual version of this communications hardware. "You can create a functional simulation of how that thing worked in software," Cowing said. The effort is akin to building a website that allows users to run older versions of computer operating systems, he added. The team is doing all of this research with the help of some active and retired NASA personnel, though the space agency isn't throwing its weight behind the project. "NASA has told us officially that there is no funding available to support an ISEE-3 effort — nor is this work a formal priority for the agency right now," Cowing, Wingo and their colleagues write in a description of the project on the crowdfunding site RocketHub. "But NASA does feel that the data that ISEE-3 could generate would have real value and that a crowdfunded effort such as ours has real value as an education and public outreach activity." The team seeks to raise $125,000 through RocketHub by May 18. The money will be used to help develop the virtual communications gear, contact and control ISEE-3 using a large radio dish at Morehead State University in Kentucky and find and analyze old documents, project leaders said. As of Thursday evening (May 1), the ISEE-3 Reboot effort had secured about $73,000 from more than 1,100 donors. Time is of the essence for the ISEE-3 Reboot Project, which Cowing and Wingo — who previously co-led a project to digitize the NASA moon photos taken by five Lunar Orbiter missions in the 1960s — first started dreaming up about three months ago. The spacecraft is cruising past Earth soon and won't be back again for 30 to 40 years, Cowing said. The team needs to contact ISEE-3 by the end of May at the latest, he added, and command the probe to perform some engine burns by mid-June. If all goes according to plan, these trajectory-altering maneuvers will send ISEE-3 back to the ES-1 point, after a close flyby of the moon on Aug. 10 that will bring the probe within 30 miles (50 km) or so of the lunar surface. At that point, the team would decide what to do with the spacecraft. The top two options would likely be leaving ISEE-3 at ES-1 to study space weather, or having it fly by another comet, Cowing said. "I hope this can be done in an open, collegial fashion, with a lot of people having input," he said. "I'd like to have people vote on where to send it. That'd be kind of cool." Whatever the unretired ISEE-3 ends up doing, Cowing and the reboot team want its science observations to be accessible to the public. "We will post that information in an open-source fashion," he said. "We want as many people as possible everywhere to be using this."